Game two of the Western Conference Semi-finals vs. the Houston Rockets was a must-win for the Spurs as they had already given up home-court advantage in a sluggish blowout in Game 1. The Spurs answered the call with a resounding victory thanks to better team effort, a few adjustments, and mental fortitude. However, it wasn’t all sunshine and roses for the Spurs as Tony Parker went down with what is the Spurs are reporting as a ruptured left quadriceps tendon and will miss the remainder of the 2017 playoffs. Leonard showed in Game 2 that he may well be in a class only currently occupied by LeBron James and himself. 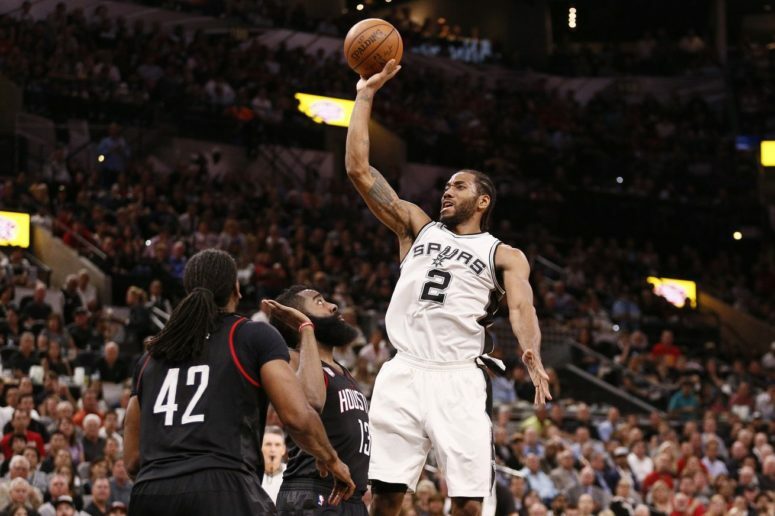 As Matt Moore of CBS Sports points out, in a series that could very well come down to Leonard vs. James Harden, The Klaw showed he can do it all on both ends even when tasked with guarding the opponent’s best player. Not many players can say that. Over at the mother ship, Tom Ziller makes his case for Leonard being the best player in basketball with a similar argument: that being the only top-10 player on both ends of the court with extreme efficiency puts him on a tier of his own. The whirlwide liter also has a nice writeup on Kawhi’s part in Harden’s difficult night. The Bad – LaMarcus Aldridge and…Pop? Throughout the Game 2 broadcast, everyone Spurs fan’s favorite color commentator, Reggie Miller, speculated that Aldridge, who looked better than in Game 1 but still not great, had a knee problem. Pop denied this is in his post-game press conference but still acknowledged he is “working through some things.” Whatever those things are, he’ll need to figure them out in a hurry, especially with the Spurs now in desperate need of a second consistent scorer with Parker out. Andrew Lynch of Fox Sports decided to grade every coach’s performance in the playoffs so far, including last night’s game, and suffice it to say he is not impressed with one Gregg Popovich. Why? Apparently he hasn’t made enough adjustments. I couldn’t disagree more; he made plenty in Memphis and last night, and I’d give him at least a solid B. While in some corners the offensive foul called on Harden for “hooking” Patty Mills in the second half is being deemed the flop of the playoffs so far, another more erroneous call from just before that has caught plenty of attention as well. That’s right, it was yet another “foul” on a Harden three, but this one might have been the worst yet and is once again triggering calls for the league to address the issue of ball-handlers creating contact before launching up unmake-able shots for free throws.